That is Inayat Khan quoted by his biographer Elisabeth de Jong-Keesing. Today’s unimaginative concert programming whisks us from peak to peak, which means we miss the opportunity to meet different people and scenery on the way. 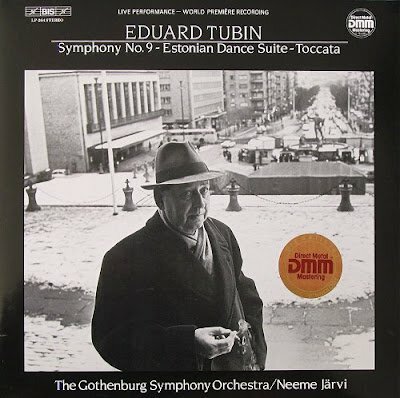 One such missed opportunity is the Estonian symphonist Eduard Tubin, the 30th anniversary of whose death will fall on November 17th. Header image show one of my LPs from BIS’ pioneering 1980s cycle of the Tubin symphonies which, thankfully, has been transferred to CD. Is contemporary concert programming too monochrome and is that one of the reasons why classical music is failing to attract a wider audience? The following comment has been posted to the linked post about monochrome programming and I thought it worth repeating here. Supposedly when Classic FM was created it picked up an audience of many millions above and beyond what Radio 3 ever had, and without Radio 3 losing numbers - according to figures quoted in http://www.youtube.com/watch?v=xCFhHKgzzhk . James Rhodes makes the point in that event that performers in most recital halls have almost zero interaction with the audience outside of playing their instrument. Few people want to watch a distant figure in a tuxedo or evening gown. I learn about new music from blogs and specialist radio shows/podcasts, not through generic radio programming. I get to live concerts according to availability, cost and interest. Audiences are potentially so much more educated now and have had greater exposure to an enormous repertoire than in previous generations, and demand more of the live experience. Frankly as the audience who rely exclusively on concert subscriptions ages, the prospect of listening to them coughing and wheezing through an expensive event is less and less appealing. Just going to another concert and hearing yet another dull Mozart string serenade as filler to whatever warhorse concerto and symphony it's been paired with simply kills my interest. On the other hand going to an event with a beautifully curated program from L'Arpeggiata or the Australian Chamber Orchestra will entice me even if I know little of the material. I've also gone to too many piano recitals that are the academic version of meat and three vegetables. I gave up one subscription series after hearing the Schumann Carnaval 5 times in 2-3 years. Most piano recital programs draw on less than 5% of the most stupendous repertoire for an instrument that has ever existed. I had meant to comment here, but followed your link to the older post, and then also to your Feb 2012 post where I've commented again. In the last two weeks I've been to three very-well attended classical concerts. The first I can barely judge other than to say that a lone cellist buried 2 of Bach's solo suites in a cavernous cathedral acoustic that; whereas the third - a typical potpourri of Germanic piano with a toss of Debussy and Chopin - was boring as batshit. Only the second, an entertaining and rather virtuosic journey from Bach to Miles Davis via very energetic brass quintet gave me the full quid in terms of entertainment and education. And I dare say anyone who listened to Radio 3 would have *loathed* it. Nowadays it seems that most of the real programming action is at music festivals, but if you're not there then I think you need to have a DVD or subscription to an arts channel to pick up more of the live atmosphere. How much of that makes its way to broadcast radio? I suspect not very much and even if it did, I suspect that it wouldn't make me a radio listener any more than I am when I download broadcasts of Prom concerts.